A total of 65 sommeliers will go head to head. They will conduct various tastings from 10 to 15 March 2019 in the Elisabeth Centre. There is a written test, a part in which the candidates must serve wine to the jury and finally a blind tasting. After the quarter and semi-finals, the three remaining candidates will battle to become number one. Belgium’s best result to date was a 3rd place for Aristide Spies in 2013. Antwerp beat the French wine city Bordeaux with its application to hold the contest. Belgium has not hosted this three-yearly competition since 1969. This was when Brussels organised the very first edition of the contest. 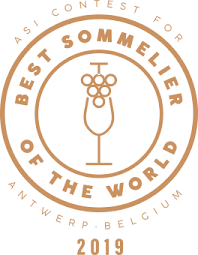 Best sommelier of the world is an initiative of the Association de la Sommellerie Internationale (ASI). The Belgian Sommelier Guild will be involved in organising the competition in Antwerp.